Jesus often refers to the kingdom of God as a vineyard and what is it that we should expect from the vineyard, we should expect wine. We all know what we should get from the vineyard, but Jesus points out that even when the vineyard produces good wine the tenants don't want to share. Sadly Jesus' parables hold true today for us. Think of it this way. All of us are part of the Kingdom of God and we are here to help build up that Kingdom. We have been given gifts and talents that we are suppose to use for the building up. Each of us, like the vineyard in the parable, is called to produce and produce in abundance and each of us like the tenant is expected to give the Owner His share. What is the Owner’s share? The Owner’s share is a part of our time, treasure and talents. If every member of the parish offered 20 hours a month to help the parish, how much work could we get done? There would never be a shortage of people to go to the prison or the hospital. People in the hospice could be visited daily. If every person gave 20 hours a month, think of how we could discover and use the talents of the members of our parish. Think of how we could build up the relationship between the schools and the parish, how we could out-reach to the poor, think how St. Vincent de Paul would be able to offer its services all year round. How about if we were more open to sharing our treasure? In this country there is a tax benefit for donating to the church, even the government encourages giving. Many will say “yes but I give to the Cancer Society, the hospital, and many other 'non-government agencies'" but this is not the same as giving back to God. NGO's did not give you your talents, your treasure, your time here on earth, God gave it to you. We are called to love God above all things and we often show this in our care of our neighbour, but that's not the same as giving back to God. I don't have to even believe in God to care for the poor, I don't have to believe in God to visit the sick or a prisoner, but for us as Catholics we do it because we do believe in God so we stand up and declare it. When you minister to the poor, when you visit the sick, do you do it as a passionate Catholic or as just a concerned member of the community? When you give to the church do you do so because God gave it to you first? Do you live your life publicly as a Catholic? When the owner comes to the vineyard you are in charge of, how will your accounting look? We can never give back to God as much as He has given us, but we could try. Or as the old saying goes, the more you give the more you will receive. [Here] monasteries are being closed and sold that are hundreds of years old because there are less and less monks and nuns. Parish churches are being closed and sold for they have no priest and so few people go to church and those who do fight for the half dozen parking spots. Often when we talk about old and new we are talking about the scriptures and the shift in the scriptures from the Old Testament to the New Testament. But do we recognize in our lives this shift also? In the Old Testament we have a focus on the law and the letter of the law and often times in our lives we are very "law filled ". This is how we did it in the past and we are not changing is a common refrain that reminds us of the law and the letter of the law. The New Testament invites us to reflect on the "spirit of the law and not the letter of the law". We can sometimes look at this as a shift from what I want to what does God want from me? Going through the old monasteries gives a person a chance to see how the old and the new have been brought together. In the "old" days they had no electricity, no heat but as the world changed they found a way to add lights and heat to the old buildings. They kept the old and embraced the new. In the "old" days there were many monks and nuns, now there are only a few so they rent out space to people seeking a quiet moment in life. In the "old" days there was no running water and often the water was not safe so they brewed beer and made wine for themselves, now they live off the money raised from selling the beer and wine and drink water. In the "old" days the walls were rock, brick or plaster! maybe if it was a wealthy place wood. Now rock walls have been torn down and replaced with new walls with insulation. But one of the most powerful things for me is walking into the chapel and seeing the consecration candles telling me that this holy place was built to stand forever, to be a place of God for all days. You cannot miss the marks on the wall where Chrism Oil was used to mark the Chapel or Church for the glory of God. But for every one marked to stand forever were hundreds like St. Patrick's, blessed to stand for awhile and then be replaced as the needs of the people changed. The "old" are beautiful in some ways but more importantly they are a reminder that the church has moved on, we are not the "old" anymore, we are something new. The letter of the law is not going to get us to heaven, but the spirit will. As I visit some of the "old" and I see the selling of the beer, wine, honey or the collection basket asking for help to maintain these old buildings I keep thinking of Jesus, "do not turn my Father’s house into a market place" but there we are, making His house a market place. There are so many empty old churches in Europe, falling into ruin yet there are so many who claim to be Catholic and friends of Jesus, yet they don't go to His house to visit Him. All of this just reminds me that it is not about brick and mortar, it's about a personal walk with Jesus, it's about a oneness with God found only in the Eucharist. Pope Francis keeps reminding us that we need a new Evangelization which has to start with each of us, we need to reexamine our walk with God, and how we live our lives as Catholics. Are we focused on Jesus in the Eucharist? Are we focused on the future of our faith? Are we handing on the faith to our youth? Are we living like Jesus, "foxes have holes, birds have nests but the Son of God has no place to lay His head". What have I learned about the old and new? These old buildings here don't get one cent from the Holy Father, because it's not about bricks and mortar, it's not about buildings, it's all about Jesus. It's time to let the old go; it’s time to let St. Patrick’s go. The day the Eucharist was taken from St. Patrick’s something changed, Jesus left the building. He is not there, He is risen. Three days that are one. If you look at these three days you see a very interesting understanding of our faith. What might I be talking about? If the three days are one day and the Easter Vigil fulfills your Easter Sunday obligation then would you not have to have attended all three days to say you were at the Vigil? From the Vigil till Mercy Sunday is the octave of Easter, 8 days that are one. So what is really going on? In the Triduum we have three very distinct parts of the life of Jesus that we need to focus on, if we push it all together we can lose sight of the importance so one or more aspects. So we keep them separate to maintain the importance of each part. For example a funeral service is made up of three distinct parts, the Vigil, the Funeral Mass and the Internment. But often people want to try and put it all into one celebration. I had one family ask if we could just do all the prayers at the grave site. Another wanted everything at the funeral mass and no one would go to the grave site. Just like the Triduum each part plays an important role in the life of the people. The Vigil service at the funeral reminds us of the life of the person and how they have touched us. The Holy Thursday service tells us of the gift Jesus has left us in his body and blood. Here these two services share a common theme and invites to know the person and to reflect on the intimacy of our relationship with them. The Funeral Mass is about the promise made to us in baptism, that we will be raised up on the last day. The white garment reminds us that in death we are equals in the eyes of God for Jesus dies for all of us equally. The Good Friday service is the rememberance of how much God loves us and how he calls all of us to himself. That even though we are sinners, Gods mercy is greater. The interment of the deceased is the letting go and moving forward in our lives. We know we have lost something, someone but we are called to move forward sharing the life of the person with others. At the Easter Vigil we also have closure, HE IS RISEN. His is not walking the earth with us anymore but he will come again but until he comes again we have been called to be His hands, His Feet, His voice to the world, we must move forward and share Him with the world. Just like Jesus, when we leave someone in the ground we know that the Spirit is not there, it is with Jesus. We can go back to the tomb just like the early disciples, but he is not there He is Risen. We need tombs and graves they are our reminders that is why so many people go back to the Holy Land, to walk where Jesus walked, but in reality He is with us walking with us and we are the ones who make Him present. Scripture tells us that where ever two or more are gathered in my name there I am in your midst. On Holy Thursday we celebrate also the institution of the Priesthood, we are called to remember that when we gather, no matter where we gather, if we gather in His name he will be with us, and if we are blessed to have a priest with us, through the priest and the Holy Spirit, Jesus will become truly present for us in the Eucharist. When ever a family gets together and shares the stories of its deceased members, those people become present once more for us for they live on in memory. At the Eucharist we gather to share the story of God, but unlike the deceased family member who only comes back in memory, Jesus comes to in what looks like bread and wine but in reality is Jesus, body, blood, soul and divinity. The next time you go to a funeral remember you are minor way living the Triduum. The Holy Father and why we need to confess our sins. On Wednesday Feb. 19th the Holy Father gave and interesting teaching on the Sacrament of Reconciliation. I include the text from the media office at the Vatican. The Holy Father dedicated his catechesis at this Wednesday's general audience to the Sacrament of penance. After touring St. Peter's Square in an open car, greeting the thousands of faithful who applauded as he passed, the Pope explained that “the forgiveness of our sins is not something we can offer to ourselves; it is not the result of our efforts, but rather a gift from the Holy Spirit, which fills us from the wellspring of mercy and grace that surges endlessly from the open heart of Christ, crucified and risen again. … It reminds us that it is only by allowing ourselves to be reconciled through the Lord Jesus with the Father and with our brothers that we may truly be at peace”. Pope Francis explained that the celebration of this Sacrament has transformed from its previously public nature to the private and reserved form of Confession. However, “this should not lead to the loss of the ecclesiastical matrix, which constitutes its living context. Indeed, the Christian community is the place in which the presence of the Spirit is felt, which renews hearts in God's love and brings all brothers together as one, in Jesus Christ”. He continued, “For this reason, it is not enough to ask for the Lord's forgiveness in our own minds and hearts, but rather it is also necessary to humbly and trustfully confess our sins to a minister of the Church”. Pope Francis, courtesy of Fr. Thomas Rosica, CSB, English language assistant, Holy See Press Office. Understanding the new changes in the Church is an ongoing struggle for many people. With the New Roman Missal we went back to some old ways and some new ways. 1. We don't kneel to receive the Eucharist. people are not forbidden from doing this but it is highly discouraged. Begging the question of why is it discouraged? Some would argue that it is a greater sign of reverence. Others would argue that it draws attention to ourselves and not to what we are receiving. One of the keys to this is found in the words we recite just before we receive the Eucharist, we profess that we are not worthy, but only say the word and i shall be healed. Because we are healed we don't coming in supplication but rather we come in jubilation and exaltation, we stand. 2. Even if we are not receiving the Blood of Christ we still bow to the Chalice as we pass by. Why? Because contained in the Chalice is the Blood of Christ and we need to offer due respect for the Blood of Jesus. In the same way before we receive the Body of Christ we should have offered a head bow to the Body of Christ in the Ciborium, we are not bowing to the Eucharistic Minister but what is in the Ciborium. 3. Receiving on the tongue or in the hand are both totally acceptable. But if we are going to receive on the hand we should make sure our hands are clean and when we present our hands that we are forming a plate with them. When we receive on the tongue, the tongue should extend outside the mouth in a sense forming a plate to receive the Body of Christ. As a general rule we do not take the Body of Christ, it should not be handed from the priests fingers to our fingers. the exception to this, and there are always exceptions. is due to age or arthritis. 4. The Rule on state of Grace has not changed. We are still suppose to be in a State of Grace, that is free from sin. Sadly many people don't seem to realize that if we have serious sins on our hearts the only sacrament that takes them away is Reconciliation. Probably the worst sin in this area is believing we don't need to go to Reconciliation. But Reconciliation is not just about what we have done, it is also about what we have failed to do. 5. Abstaining from food for an hour before receiving the Eucharist is also still in affect. And for those not aware, that includes not chewing gum during mass. One of the upsetting things is people taking the gum out of their mouths to receive Jesus and then putting the gum back in right after. Then particles of Jesus become mixed in with the persons gum and sooner or later they throw the gum away, with Jesus stuck to it. 6. Now after we receive we stand until everyone has received and then we kneel or sit to say our personal prayers. Again the exception for this would be the elderly and parents with small children. At the "One Rock" celebration summer of 2012 several thousand young people gathered around to pray in front of the Blessed Sacrament. 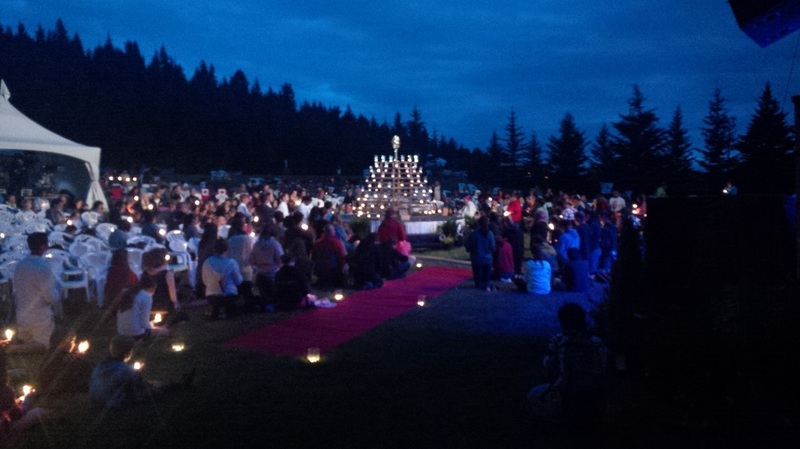 We began outside as the sun was going down and ended in the dark with the candles around the Blessed Sacrament providing light. Most amazing was the non Catholics who were present and how this touched them. Praying before the Blessed Sacrament is one of those Catholic things that we do and often do not fully understand ourselves. It is one of those Ecumenical times when Christians can come together in prayer but it is also one of the dividing elements in the Christian faith. A friend of mine from University time used to give me a hard time about worshiping Mary but he found it even more strange that we would kneel in front of a "piece of bread" as he put it and expect something to happen. It is very hard to explain somethings to others, but that does not stop us from loving each other. As we knelt there you could see people kneeling but it was what you felt. There was something very special happening. What I noticed was we all knelt, generally you kneel for a short time and then sit, no this time, this time we stayed kneeling. Jesus comes to us in the Eucharist to bring about change, but that change begins inside each of us. If I am not at peace, how can I bring peace into the world? If I am not at peace how can I expect peace around me or in my family? At the mass we offer each other the peace of Christ, but do we know what we are offering? When we offer Christ's peace to the other we are offering Christ's love. Many of you have asked how Fr. John is doing in Rome, and I am happy to report that he is doing very well. As you can see he has not aged one bit and still looks as studious as always. We went to listen to the Holy Father together and had a wonderful day together. We even went out for supper together and yes I did charge it to the parish and now you can all say you paid for Fr. John's supper in Rome. He offered his prayers for all of us and please remember to pray for him. So how do you stay in touch with the parish in an every changing world? How many people actually read a parish bulletin? How many people really know what is going on in their own parish? And if they read the bulletin do they retain the information? These are the kinds of questions often asked by priests to priests and priests to parishioners. So what might be the answer? When I was taking my degree in Business we often talked about two approaches to getting a message out, one the scatter gun approach and the other was the high powered rifle approach. Can you tell there was a bunch of farm boys in my group? The scatter gun approach was based on you tell or leave your message in as many places as possible, sort of like leaving 8 by 10 photos all over the place. The high powered rifle approach was one big photo in what was assumed the best place. 1. we have a grief program for some one who has lost a spouse but we don't have a grief program for people who have lost a parent or child, these people need our help also. 2. we have a youth program for junior high kids but we lack the ability to grow it because we need more young men to help as leaders. These men could be married or not, they just need to be willing to help. Boys need male role-models to look up to and they need them in their own environment. These are just a few things we need to be aware of. The other thing for me as a priest is the question of how often do we need to be reminded that God is truly present in our lives. On my phone I get daily updates from the Vatican, the Popes daily homily (not that I would ever steal his material), daily inspirations, Catholic thoughts and others. Why do i subscribe to these? Because I need reminders to refocus throughout the day and keep Jesus front and centre in my life. If I am the priest and I need this help, and I am sure i am not a whole lot different than other people, where do the people of God find their daily help to stay focused on Jesus? How many of the apps on your smart phone are for Games, music, shows etc? How many are on your phone for the big guy? How many God apps do you have on your phone? One is nice, many is better! Fr. Kevin Tumback is Pastor at All Saints Roman Catholic Parish in Lethbridge, Alberta. Fr. Lukas Drapal is Associate Pastor at All Saints Parish.